The Children’s House, Seychelles, has been providing a safe and inclusive Montessori education for children for over 21 years. 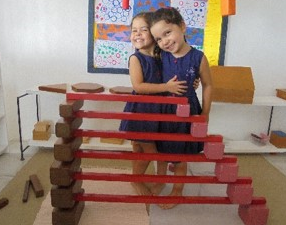 The Montessori method of teaching provides children with a carefully prepared environment, which nurtures the development of their independence, concentration, confidence and creativity as well as their social, language and motor skills. We focus on providing the individual child with life skills, which will help them become independent, confident learners and grounded and rounded individuals. The children’s development is celebrated through observations, and recorded in their own Learning Journal, which the teachers use to inform further planning. Our School lays a strong emphasis on encouraging children to become involved in the community, both local, national and international, helping them to become conscious members of the society in which we live. The school provides the children with opportunities to become fit, healthy young people by developing good eating habits and daily physical activities and exercise. The Children’s House offers a very unique experience to children and we consider it a privilege to be entrusted with your child.